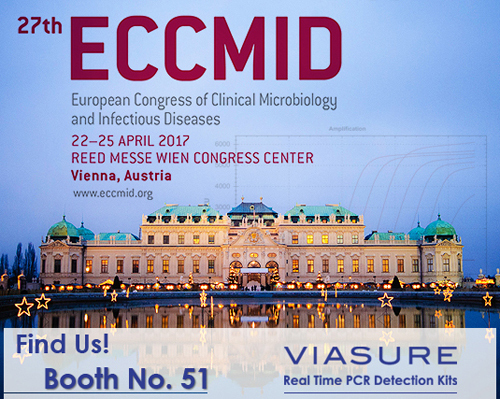 ECCMID 2017 is the 27th European Congress of Clinical Microbiology and Infectious Diseases, which will take place in Vienna, Austria, from April 22nd to 25th. The world’s leading experts will come together to discuss the latest development in infectious diseases, infection control and clinical microbiology. CerTest, as a leading company in the diagnosis of infectious diseases, participates in this edition with its own space, where will showcase the latest developments and innovations of its product families VIASURE Real Time PCR Detection Kits and Rapid Test. VIASURE Real Time PCR Detection Kits is the diagnostic product line, based on molecular biology, that allow the identification of the pathogens causing infectious diseases from the present DNA in the sample. With more than 45 references available, the new MULTIPLEX kits allows the identification of several pathogens in a single assay, which can be sent and stored at room temperature thanks to the lyophilized format of the reagents included in each kit. The Rapid Test family will also increase its number of available products, with new developments designed to offer a sensitive and simple screening test for a presumptive diagnosis in infected persons, like the new S. pneumoniae + Legionella Rapid Test, which has been improved to obtain the better and reliable results from urine samples. Venue: Reed Messe Wien. Messeplatz 1. Viena, Austria. Dates: del 22 al 25 de abril.